A very Merry Christmas to all of you out there. I hope that whatever the season means to you and yours, it is filled with family, companionship and most importantly beer. I am travelling interstate over the period (have been doing so for the best part of a couple of weeks actually) and will be spending the festive season in Victoria. Firstly in Beechworth with my fiancée’s family and then in Melbourne with (most) of my family. One of the family traditions we have in my family is a movie or two on Christmas night. I have wrested control of the film choices away from my mother this year. I love my mother dearly, but she has a chequered history in terms of Christmas movie choices. Trailers for my two choices which I have specially bought brand spanking new blu-rays of are below. The first is, I think, universally regarded as a Chrissy classic. 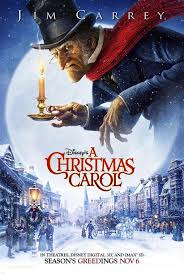 The second is in my opinion probably the most underrated adaptation of Dickens’ iconic A Christmas Carol. Do you and yours have any Christmas movie traditions? Merry Christmas, Tim! Nice picks there. Right now I’m watching Christmas specials by Michael Bublé and on Christmas Day I’ll make sure to watch Love Actually, The Holiday, A Christmas Story and It’s a Wonderful Life. A busy Christmas Day of flicks you had planned Fernando. We ended up watching most of Love Actually as well. That’s a classic 😉 And it was a busy day of movies, alright. Managed to watch all of those and even snuck in a viewing of The Heat. Oh cool. What did you think of The Heat? It was fun, nothing extraordinary. Loved Bullock in that one. She’s having a great year. Great chemistry with McCarthy. Yeah I liked it as well. Was really enjoyable for what it was. Yes, it was fun enough. Just following up on all these messages now. Thanks for the thoughts Cindy. Hope you had a nice festive season as well. Love the new animated A Christmas Carol! Don’t like Home Alone at all and would swap it out for Gremlins 🙂 Hope you had a great holiday! Well if you have to swap out Home Alone, Gremlins is absolutely the perfect choice. Didn’t even consider that as a Christmas viewing option actually.